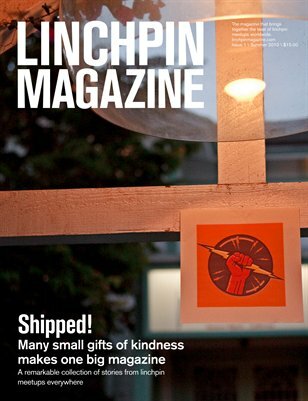 On June 14th 2010 thousands of people took part in the first ever unofficial official Linchpin worldwide meetup. This was a completely non-commercial chance to find and connect with other members of Seth Godin's tribe. We wanted to capture the energy, ideas and inspiration of that event and share it globally. Each of us met at least one new person on June 14th, and had at least one conversation. Some were inspired to think thoughts they haven't thought, others were exposed to new ideas, some made lasting business connections or friendships. It was an experimental, thought provoking evening for all of us. We captured the energy, ideas and inspiration from this event and turned it into something wonderful to share with the tribe. A lovingly created, beautifully designed magazine, written by all of us who attended, telling how the meet up inspired or challenged or changed us. All profits to charity.